Way back in March in that glorious warm sunny week it all looked so promising for the year ahead. We got some early carrots sown then which was just as well because some of the later sowings produced nothing even with two attempts. Then it all changed to a mostly cold wet summer and party time for slugs and snails. The plums had plenty blossom but as it turned colder and wetter there weren’t many bees about for good pollination . Whereas last year we harvested full crates this time it was merely a handful. 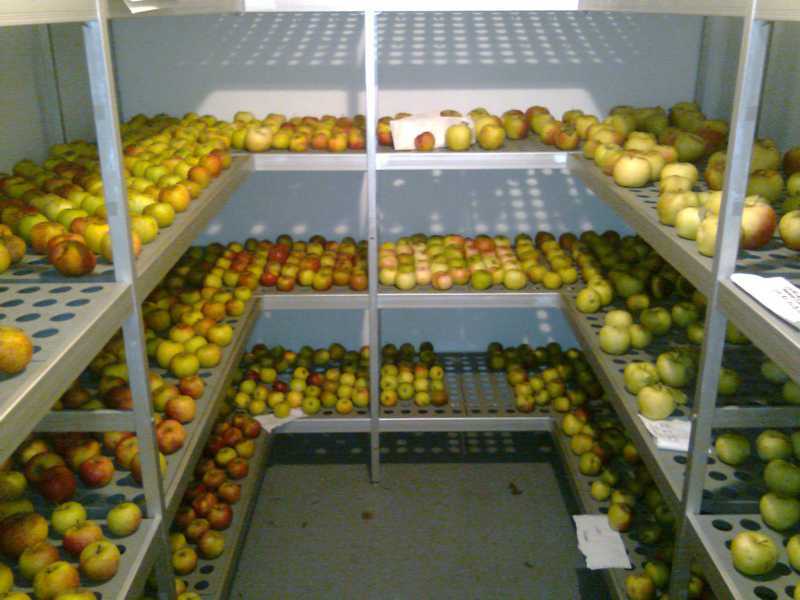 Apples were looking the same but in the end we did manage to fill about three quarters of the cold store. With all the wet weather this Summer it was very rarely dry enough to do any hoeing so there was a lot of hand weeding and it was a struggle to keep on top of this. Weeding some of the early crops was not a fun task in cold weather as you can see from below as a colleague weeds parsnips in full winter gear. Our chef @suzi4goodfood used the thinnings from the parsnips and carrots for some tasty new season meals. Despite the difficulty of getting carrots to germinate we did get a very good crop with the variety chantenay red cored being a great success. We also grew some wonderfully wacky shaped carrots of white satin. With the incessant rain all the root crops did well with good beetroot , carrots , parsnips and celeriac. It actually shows how much water these need to bulk them up to a good size. The only really failure this year was onions which obviously don’t like the cold and wet and some of them just sat there all season making very little growth and resulting in a very poor harvest. Early potatoes Amorosa (red) and Charlotte were again a great success and went down well at the conference centre. I wasn’t sure we would get any pumpkins this year as even under fleece in the cold the plants struggled to get going but in the end we got some monsters. We supply some of the herbs for Neal’s Yard Remedies and keeping the Calendula clean required another hand weeding effort but it was well worth it. We managed to send the flower heads most weeks through the summer somehow finding dry spells for harvesting. Picking the flowers was usually a team effort with help from the office staff who were glad to get outside for an hour. At the conference centre once a month there is now a Shhhh secret supper club which has been a huge hit and are usually sold out within a few days of the tickets going on sale. See website for details The idea had been to host them at various venues throughout the farm but this proved impossible with the poor weather . However in May we did manage a night outside in the Physic garden by the conference centre starting in the amphitheatre. We try to supply all the vegetables and fruit for these events and here is a selection harvested for one of the supper clubs. Sprouting seeds continue to go down well and there was plenty of colour to add to the chefs selection. Giant red mustard , spinach beet , rhubarb , canary yellow and white chard. Its always interesting to try and grow something new and this year we grew sweet potatoes in the glasshouse border and another first for me was borlotti beans. Its a very exposed site at the walled vegetable garden so growing anything tall is not easy but the beans did reasonably well . The sweet potatoes on the other hand although they grew well we only harvested very small tubers .I think we will leave this one for warmer countries. Until this year I didn’t even know they were a member of the bindweed family and it was interesting asking visitors to the glasshouse what they thought was growing. 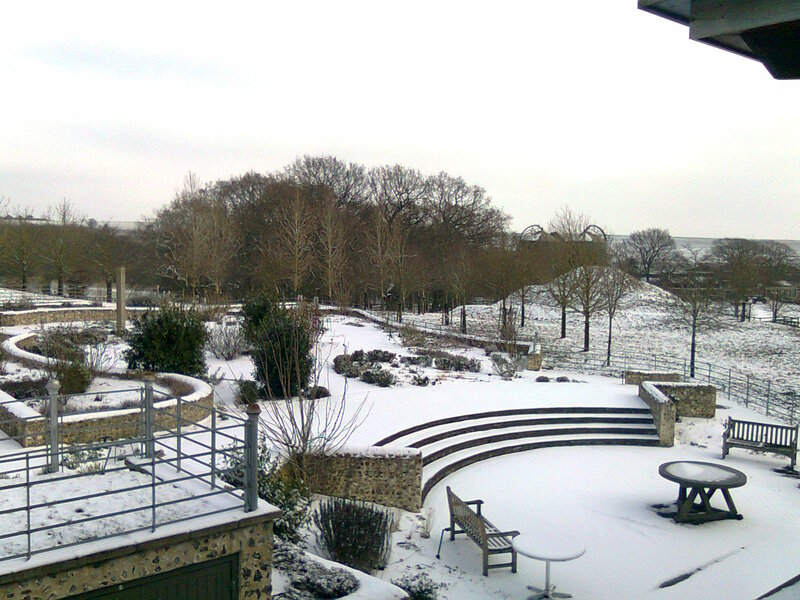 The farm was eventually given permission to install a small wind turbine which was put up earlier in the year in the paddock below the walled garden . Its nearly always windy here although there have been a few rare occasions when it has stopped and birds settled on the propellers. We have a few chickens up at the farmhouse to provide eggs for the conference centre and I was reminded of ‘Chicken Run’ when Russell the rooster tried to make a break for it hitching a ride in the back of our electric buggy. During the summer a Pyromaniac hit our compost bins. He was trying to hide but we caught him. In October the Berkshire Countryside Volunteers came to help for a day which included a lovely lunch at the conference centre. One of their tasks was helping to harvest celeriac for storing .If you would like to Volunteer at Sheepdrove see the contact details at the bottom of this link. Now we are making Christmas wreaths for the shops. Lets hope next year will be easier for growers with lots more sun and a lot warmer. Its far too long since I wrote my last blog so its time for an update with all that has been going on in the gardening department and around sheepdrove. After a mostly mild winter apart from the severe cold in February the snowdrops are out and the glasshouses are reaching temperatures well over 20degrees on sunny days so Spring is at last on the way. 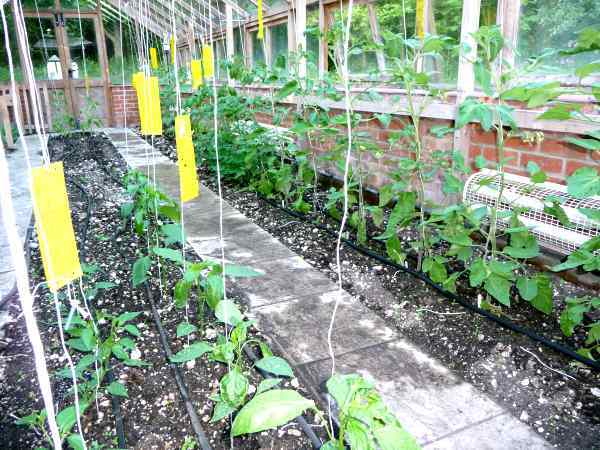 After the summer crops of Tomatoes and Cucumbers field beans were sown in areas in the glasshouses and polytunnel which will also be dug in soon. 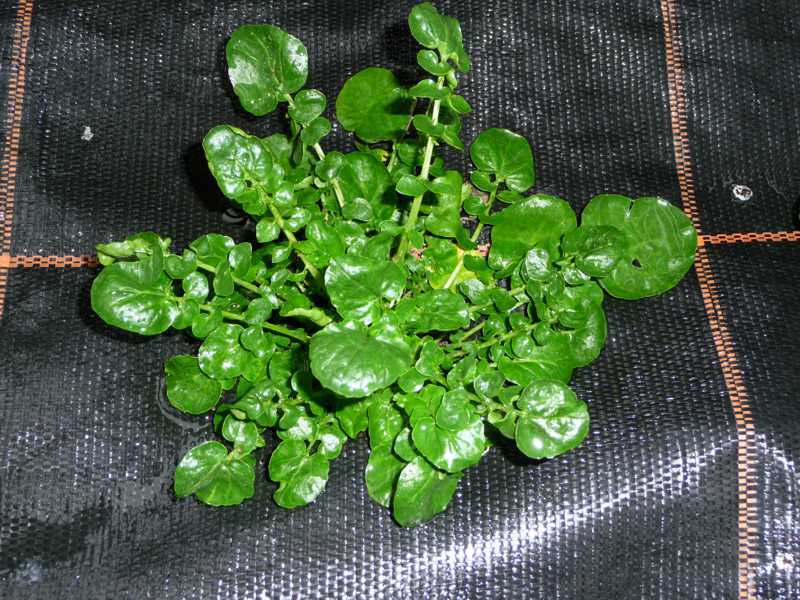 This is very hardy and suitable for overwintering with deep roots which fix nitrogen. Its an experiment under cover but we will see how it works. 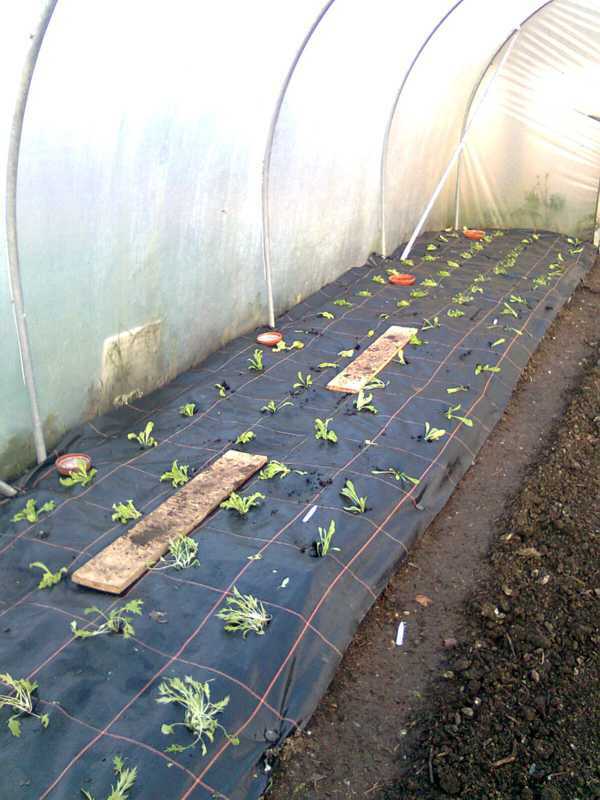 Winter salads were planted in other areas through mipex in the polytunnel & glasshouse; mizuna, winter purslane , winter cress, chicory sugar loaf, endive markant, oriental mibuna and giant red mustard. Unfortunately we have had a mouse problem in the polytunnel and lost probably half the crop which would be ready to harvest now although we have been using small amounts through the winter. They will be replaced shortly by a spring sown crop which are in cells ready to plant as soon as we have got on top of the mice. Spring cabbage (pixie and winter green) planted in the glasshouse in the autumn is starting to heart up where there was frost protection heating and in the cold glasshouse this will follow on.An early crop of carrots will also be sown in the polytunnel and some carrots and radish in the glasshouse. Chilli plants were kept in heated glasshouse at 10-12 degrees C and we even picked some ripe chillies in December. We had a good apple harvest and these are stored in cold chiller kept at below 4 degrees C. Carrots and beetroot were also stored in here. 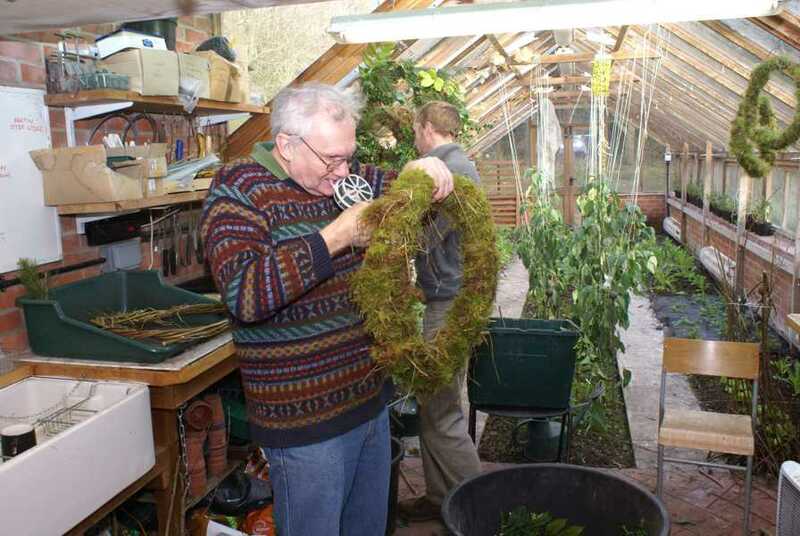 In December we make wreaths for the shops , farmhouse and conference centre. The hoops are made from willow woven together and the moss and plant material comes from the farm. 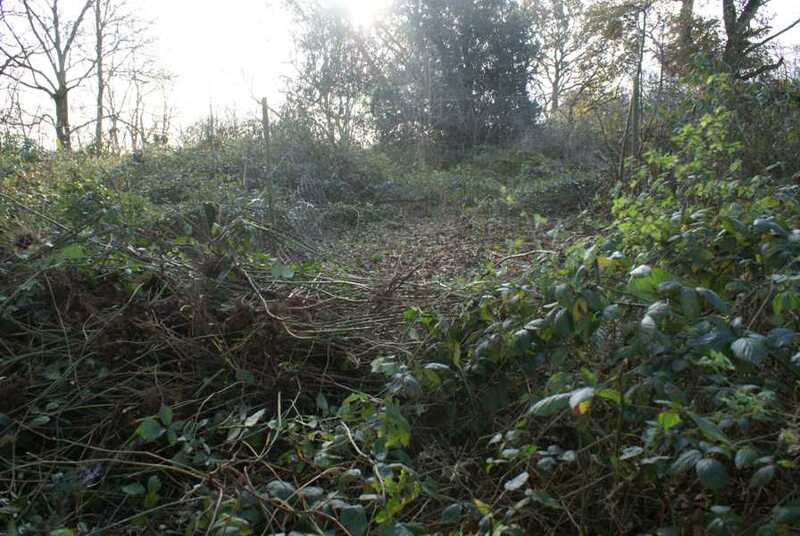 Through the winter we have been doing a lot of work in Nut wood renovating an ancient woodland to bring it back into a proper coppicing rotation .It was a daunting task when we began clearing an area buried in brambles 2m tall and completely entangled . However with help from volunteers and other staff we managed to overcome it. Its necessary to dig the roots out with the buds otherwise they will just grow back. This area is now planted up with 50 young hazels. We grow a range of plants to supply Neal’s Yard Remedies. The plot is being redeveloped to make it more of a feature for visitors to Sheepdrove. The east end was ploughed before the severe frosts in February which broke up the soil nicely. It will have boarding edging added to make 3 new sections. There is a couch grass problem in certain areas so one plot will be covered completely with mipex for a season. Potatoes will be grown on another bad patch which will give us a chance to dig out more couch grass at harvest. . 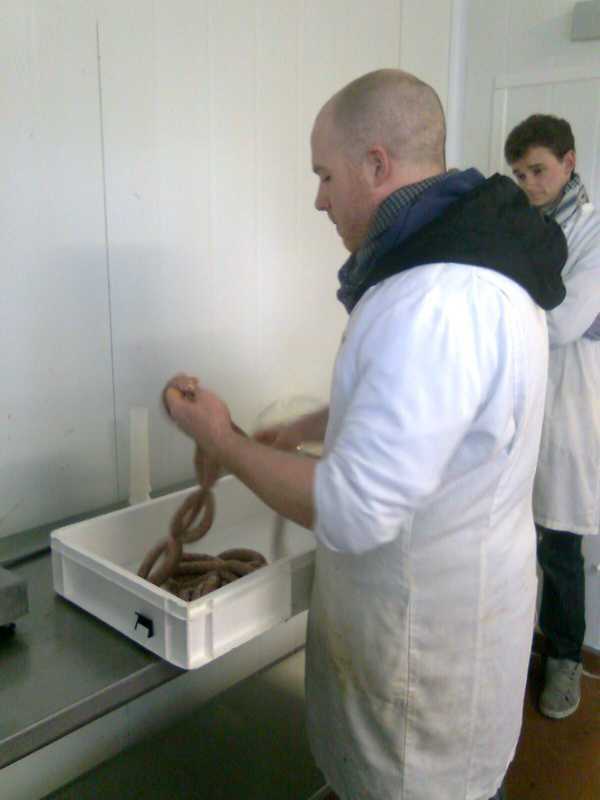 This year we are trying some heritage varieties ; Shetland Black & Highland Burgundy. We have recently planted more garlic in one of the new sections which had been overwintered in cell trays in frames. Early vegetables are ready to be planted out under Fleece throughout this month and its time to do the Spring pruning of shrubs. Winter so far has been marked by huge flocks of fieldfares in the hedgerows and woods. As the extra hedgerows planted on the farm in the last fifteen years mature the hawthorn and blackthorn are producing more berries. These are providing a much needed food supply to the beautiful fieldfare, a close relative of the song thrush and mistle thrush. Most of our fieldfares breed in Scandinavia and northern Russia and I was lucky enough to see some in the pine forests of Finland a few years ago. To avoid the harsh winters of the Arctic the birds fly south in Autumn to seek out the milder climates of Britain where there are plentiful berries. The Berkshire Downs support very large numbers of fieldfares and they can add much excitement to a walk along the Ridgeway in winter. We have regularly been seeing flocks of over a hundred this winter on the farm, moving from hedgerow to hedgerow seeking out any remaining berries. If you are responsible for hedgerows or even an isolated hawthorn tree then you can help the fieldfare by not cutting the foliage back every year. The flowers which form the berries only grow on a second year branch so if a hedge is cut every year then few or no berries will be formed. The remarkably mild winter (until February anyway!) meant that the bluebells in our ancient woodlands came up remarkably early and I was able to map their location in January. The plan is to record their distribution each year to see how they respond to our woodland management – we are hoping that they increase! The bluebells love the hazel coppice in our ancient woodland, Nut Wood. 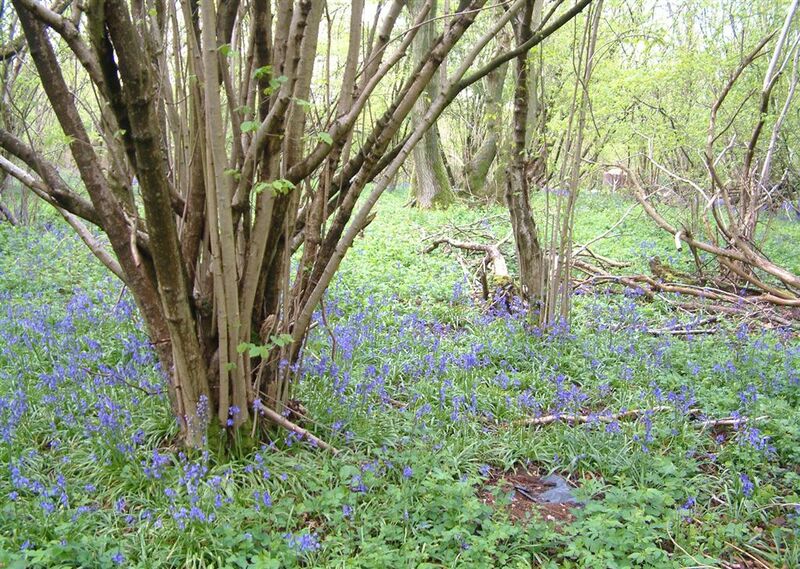 How we hope Nut Wood hazel coppice will look in May, with bluebells everywhere. 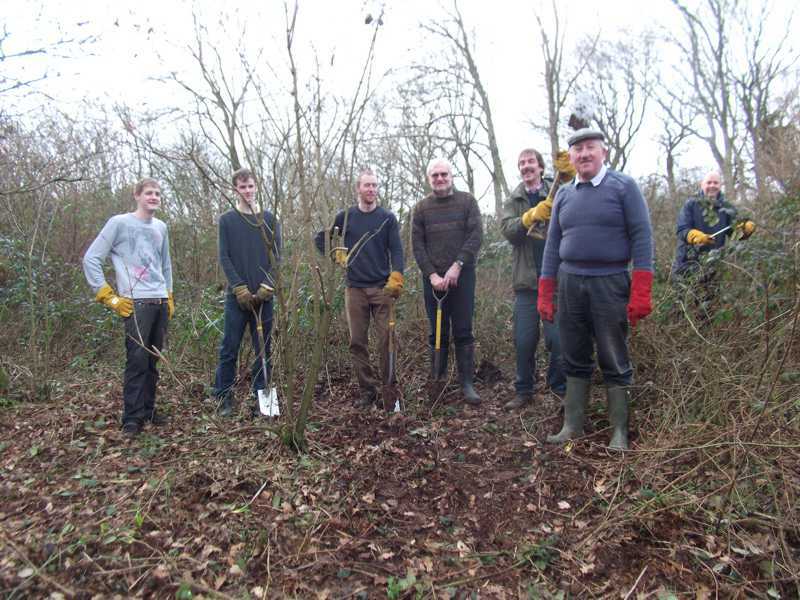 Last week Sheepdrove Organic Farm Volunteers planted more hazel trees into the wood, both to help wildlife and to provide a sustainable supply of hazel rods for the gardens and for charcoal making. 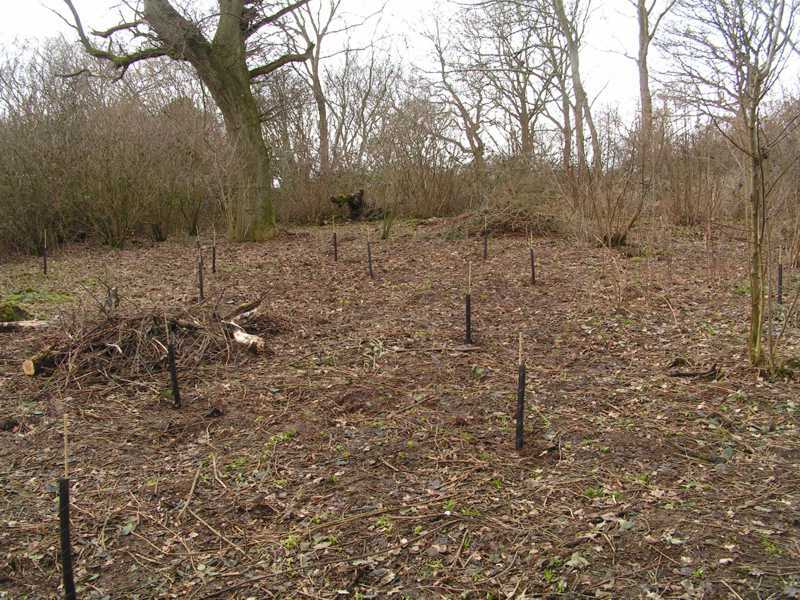 The hazel trees can be coppiced every 10 – 15 years, continuing an ancient tradition, and providing a variety of habitats for nesting birds such as warblers. 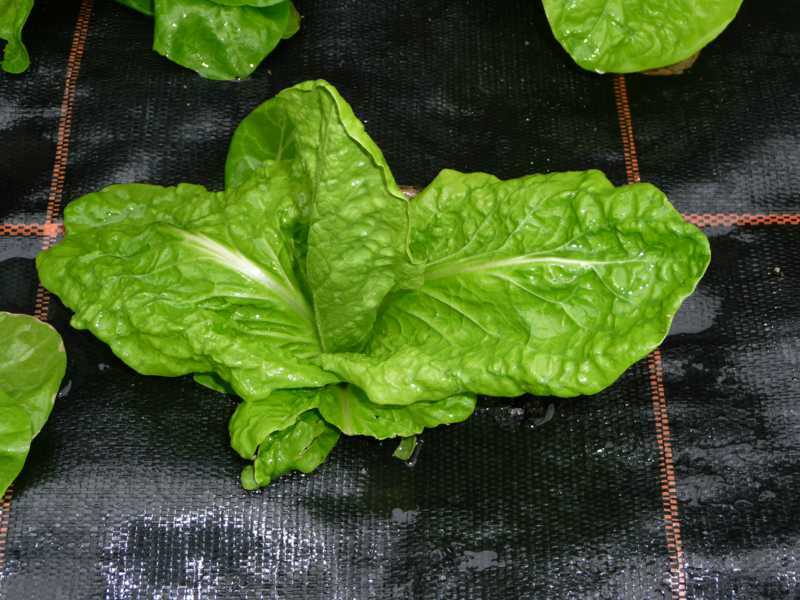 They will then regrow, creating a sustainable product, that can be harvested over and over again for hundreds of years. 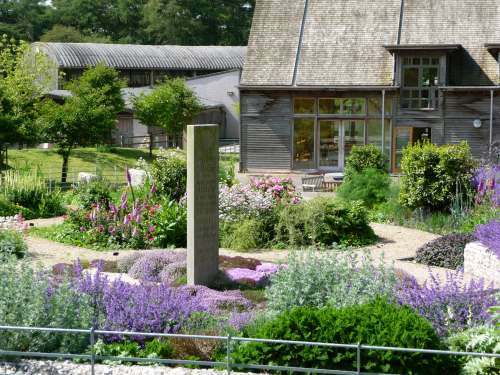 Our garden team use the hazel rods as pea sticks, supporting our organic runner beans and peas that are used for meals at the Eco Conference Centre. 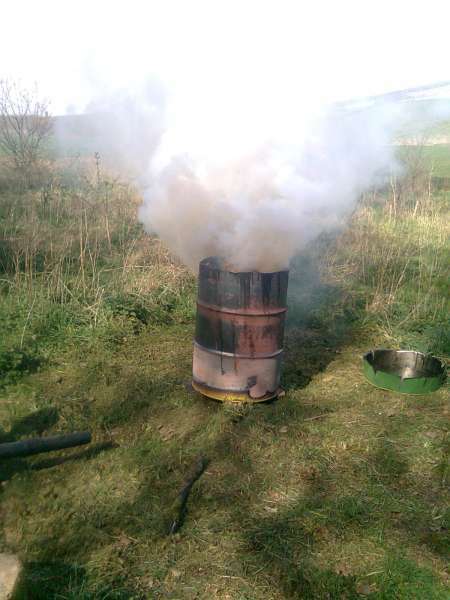 And if the hazel is allowed to grow for longer it provides an excellent material for our charcoal burner (see photos in the SheepdroveGarden blog below). 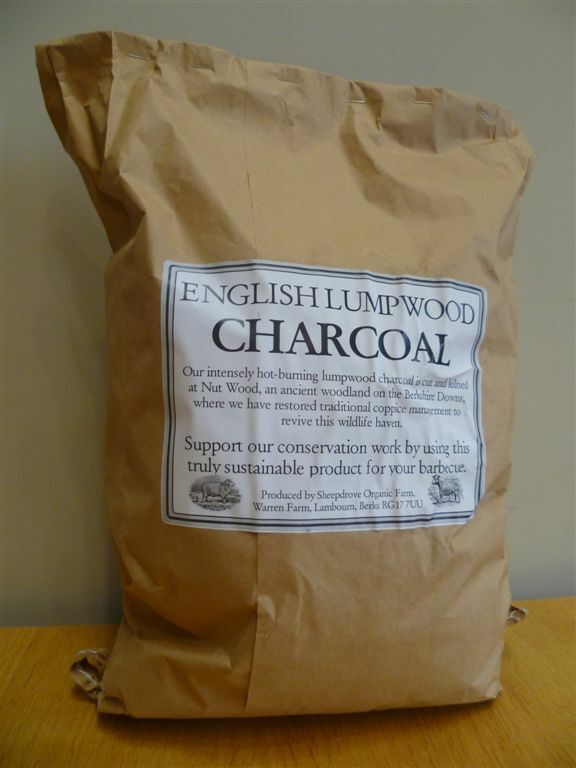 Sheepdrove Organic Farm charcoal is usually available from Sheepdrove Eco Conference Centre, and our shops in Bristol and London although best to check before going specially. Our charcoal, bagged up and ready to use. After such a good start to the year with a warm sunny Spring its been a dull Summer which hasn’t contributed to the growth and development of some crops. Melons after planting both in frames and in the glasshouse sat around for ages before beginning to grow again and we won’t be getting any melons this year. Although the tomato plants grew well fruit has been slow to ripen and taste and texture has been poor(with a flavour reminiscent of cotton wool ) I am informed as I can’t eat them myself due to an allergy. Even regular feeding with comfrey liquid to increase potash doesn’t appear to have improved the quality by much. Many people are saying similar as to the taste of tomatoes this year so lack of sunshine is surely a factor. The only other poor crop this year has been dwarf French beans which in my experience do better in a dryer and warmer summer. Most of the other crops have done well with prolific cucumbers in the polytunnel, good sized onions and some monster beetroots. Other successes in particular were lettuce, plums, strawberries, fennel, carrots and garlic. Runner beans and autumn raspberries have faced constant battering by winds which have done them no favours.The sweetcorn was blown sideways after the severe winds last week and we had to stake all the plants which is a first for me. This was probably planted a little late on our exposed site but its nearly ready now. We have kept the conference centre well supplied with vegetables and any excess has been sent to the Bristol shop. The south facing greenhouses were leaking badly whenever it rained so when it was dry we have been up on the roof sealing with silicone which has improved the situation considerably. The rain blown horizontally by last weeks gales revealed further leaks however where no rain could normally be expected to go requiring another assault on the ridge and hopefully curing the problem for the winter ahead. We have already sown some Hungarian rye after early potatoes , early lettuce and onions. 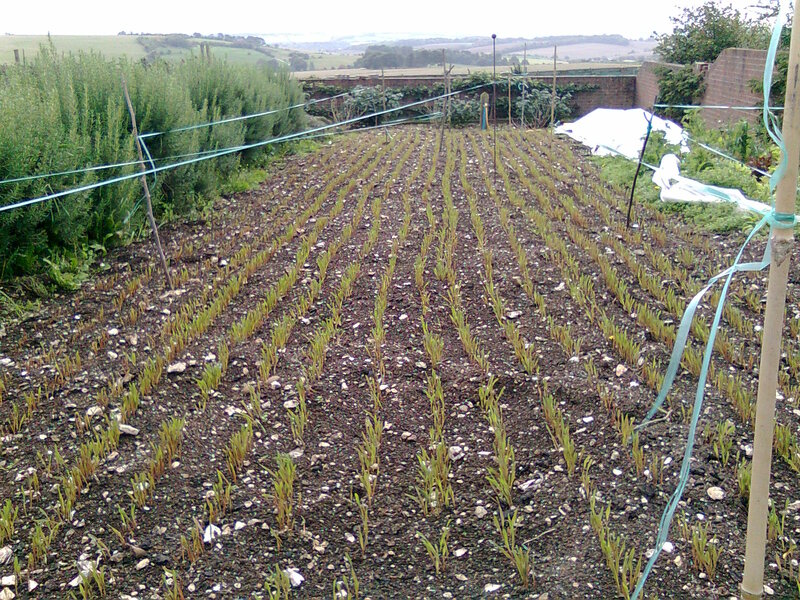 When the carrots are harvested for storage these beds will also be sown . This is a good cover crop over winter to prevent nutrient leaching and its deep penetrative roots are good for soil structure. It is also a good weed suppressant and continues to grow in cold weather. 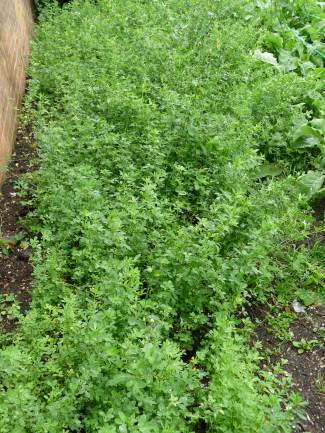 The use of green manures is an important part of organic growing. Two beds were sown with alflalfa in the spring. This is very deep rooting so again useful for soil structure and also bringing trace elements to the surface. This will be overwintered and dug in next Spring after the tops are cut down for composting . 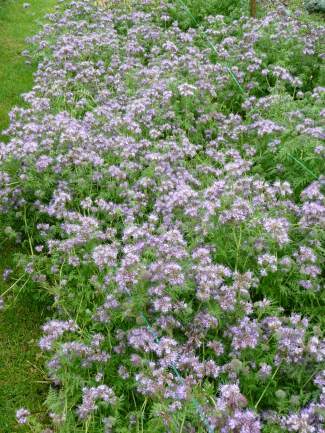 Also grown were Phacelia which has an extensive root system to improve soil structure and with dense foliage for smothering weeds. The blue flowers are very attractive to bees and benficial insects such as hoverflies which eat aphids. Fitting in with the legumes red clover was sown which is one of the best varieties for fixing nitrogen from the air , weed suppression and improving soil structure. 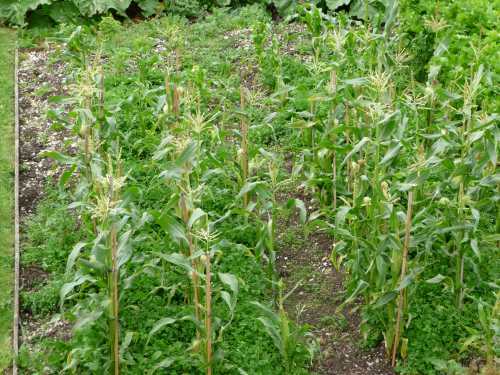 Trefoil will tolerate some shade and is useful for undersowing once crops are established such as sweetcorn. It is good at fixing nitrogen and once the crop is cut down it can be left overwinter to protect the soil. 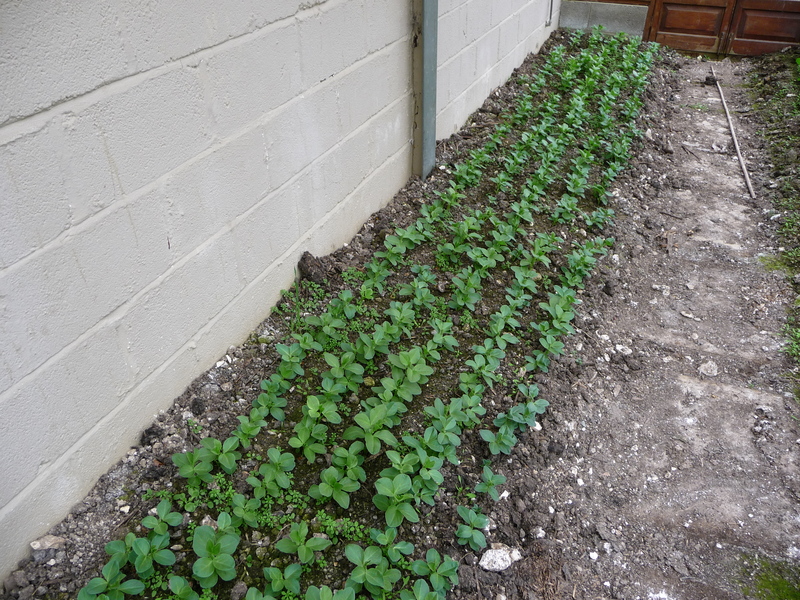 Trefoil was also sown on a small area in the glasshouse which will be dug in before planting up with winter salads. There is one more green manure to sow which is field beans after summer legumes and in parts of the glasshouse and polytunnel after the tomatoes and cucumbers have finished. They germinate well in colder weather and can be sown from September to November. We have a few chickens up at the farmhouse and the problem of them pecking holes in their own eggs was solved in 3 ways: The placing of golf balls in their nesting boxes acted as a deterrent towards further pecking of rounded objects, a dietary supplement of broken shell solved their calcium craving and Mr Fox made off with the chief protagonists for his dinner! The remaining chickens were penned in behind electric fences and have maintained numbers (18) since the dreadful discovery. They are due to be joined by 20 newcomer hens this week. The Gardening Team have done their best to mentally prepare Russell, the sole cockerel, for their arrival. The potager at the farmhouse was an abundance of colour throughout the summer. 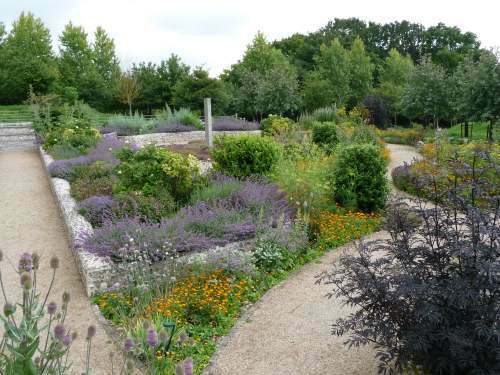 This along with other areas will be available for public appreciation next year through the National Gardens Scheme on 1st July. For Neal’s Yard remedies we have harvested chickweed , oats , and elderberries. 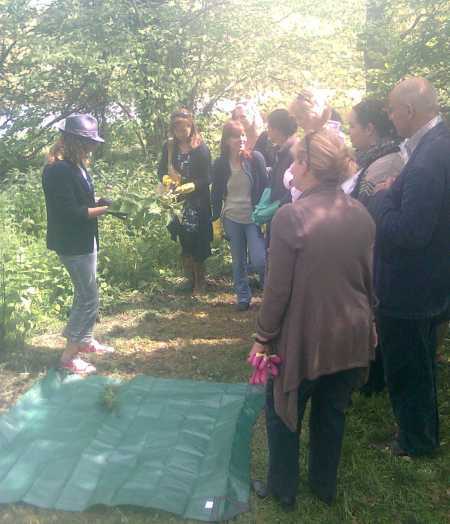 Last week competition winners from Neal’s Yard spent a day at Sheepdrove and helped with harvesting hawthorn berries. These are used in combination with other herbs to help lowering high blood pressure. 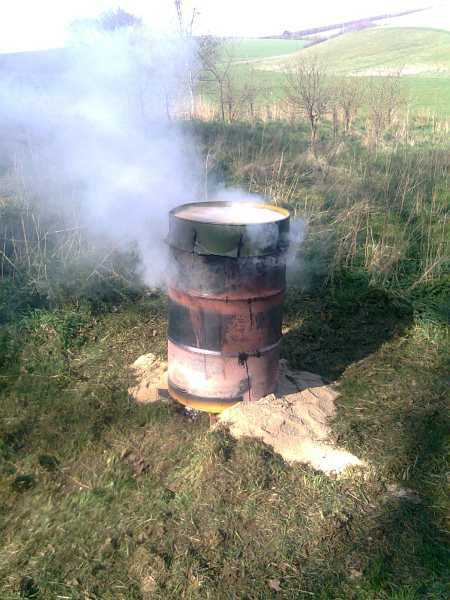 We made more charcoal with the large burner . This is sold at the conference centre and at the shops in London and Bristol. Our lumpwood charcoal gets hot very quickly and saves that time waiting for your barbecue to warm up before you can start cooking. If you have managed to follow this to the end you now reach the funny moments to report. 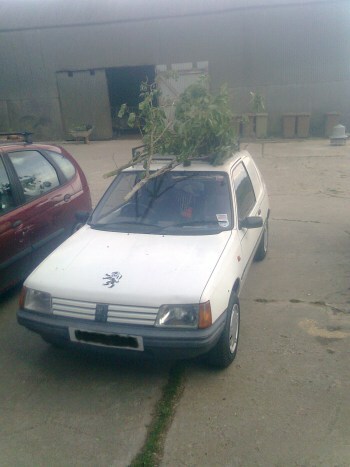 One colleague while strimming around the farmhouse managed to lose his car keys from his pocket. Although not funny at the time in retrospect we can laugh about it. We found someone who had a metal detector and after 2.5 hours searching finally found his keys and he was able to get home that evening. The same person also had her hair adhered securely to a yellow sticky trap causing an impromptu hair cut as the only safe way of release. So autumn is here and the ever-present winds up on this ridge continue and the temperature is beginning to fall overnight.. The spiders have made their way into the greenhouse and the wasps are drunk and dangerous amongst the windfall apples. The mornings can be chilly though the afternoon sun we sometimes see is glorious and there is a beautiful quality of light over Lambourn Valley, rich and with a tint of orange. Sheepdrove Organic Farm has such as good variety of wildflowers growing in its crop fields, its arable flora is of National Importance. What a relief to get some rain this weekend. Everything was getting desperate for it. The young trees we planted to create wind breaks for extra bee hives have been suffering the most although we have been watering them regularly from a water bowser. The calendula ( for the bees) was sown after rain was forecast the previous weekend but hopefully now this should all germinate well. All the new planting and direct sowing of vegetables were watered in rotation overnight using a timer and oscillating sprinkler.. Plenty of vegetables are now planted out mostly under fleece and we have been harvesting radish, lettuce and asparagus for a few weeks. The first bed of carrots has germinated but unfortunately I missed the pre-emergence flame weeding as it came up very quickly . 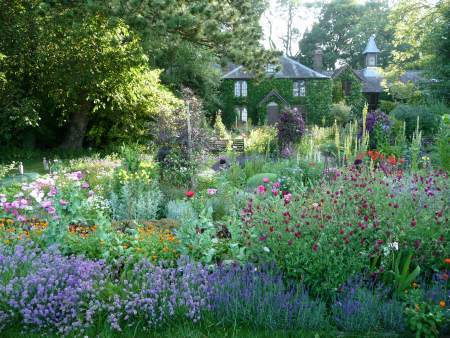 The first bed was a mixture of varieties including Chantenay, Fly Away, Yellowstone, White Satin and Purple Haze. The second bed of Autumn King is now sown. The early Tomatoes , Cucumbers and Peppers planted in the heated glasshouse are thriving. 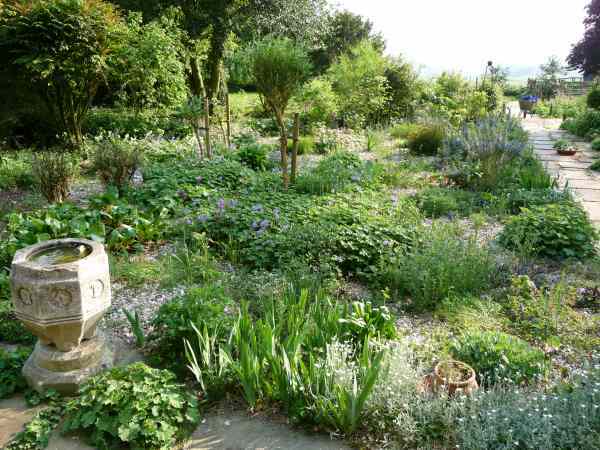 The Potager and gravel garden are transformed now. We have begun to plant the Potager with early annuals and vegetables ; cornflower black boy and diadem, poppies black paeony and blackcurrant fizz, nicotiana fragrant cloud , verbena bonariensis , Italian, French and moss curled parsley, Bulls Blood beetroot and a mixture of lettuce. 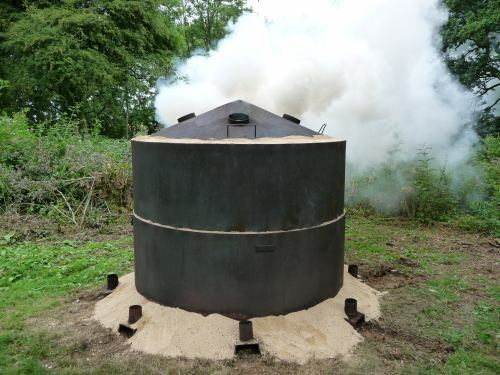 In June we will be running a charcoal making day so we did a trial run in a large oil drum. Including preparation it took about 6hours before it was ready to close up and leave overnight. 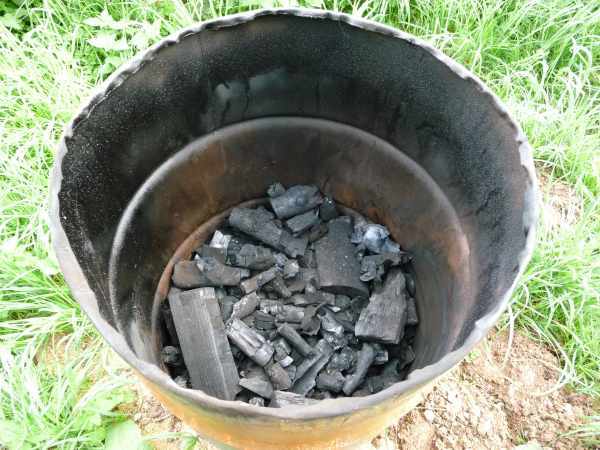 The quantity of wood put in reduces to about a fifth but we had some good charcoal on inspection the next day. 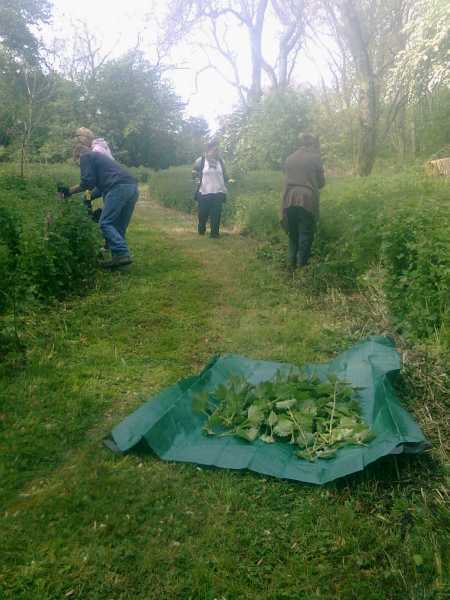 This week people involved with Neal’s Yard Remedies came down for a day at Sheepdrove and to help harvesting Nettles (Urtica Dioica), Cleavers (Galium Aparine) and Comfrey(Symphytum Officinale). Dried nettles are a natural anti-histamine and also have anti-asthmatic properties. For hundreds of years they have been used to treat painful muscles and joints and arthritis. Also used now for urinary problems. Dried or fresh cleavers is said to have anti-inflammatory , astringent, diaphoretic, stimulant and diuretic properties. Comfrey has a long history of use to promote the healing of bones and wounds and internal use to treat ailments such as arthritis and ulcers. Russel the rooster has been getting a little shifty this month and I was kung fu kicked on the leg and a colleague was also attacked. 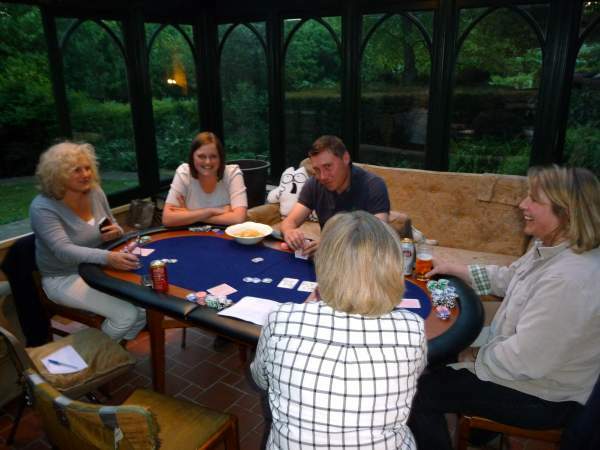 We have now had two Sheepdrove poker tournaments . The first one was taken down by Cool Hand Luke who unfortunately couldn’t defend his title last week as they are lambing on the farm. This weeks game was a re-buy which was won by Raise Every Hand Suzi. Best hand of the night involved 4 players with 3 all in and two flushes . The Queen high flush was beaten by the Ace high flush and 2 players were knocked out. It was the second time of the night our IT man was beaten by a higher flush which was very unlucky. May rebuy-tournament. Who has all the chips already? 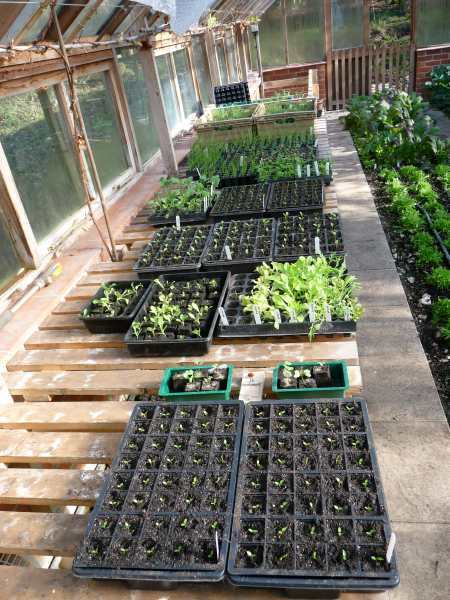 The last month has gone by very quickly and with reasonably dry weather we have got on well outside but there is also always plenty of glasshouse work at this time of year with sowing and pricking out and potting on. 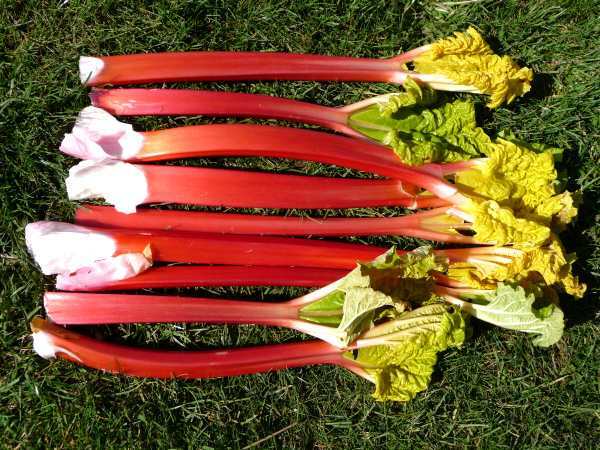 We harvested the first forced Rhubarb at the end of February helped on by a relatively mild spell. Most of the winter Brassicas are now finished and sprout stalks and kale stalks have been chopped up and added to the compost. The ground from these will have manure dug in or rotovated . My preference is always for partial double digging ( forking over the base of the trench) if time permits. Unfortunately very little of the purple sprouting broccoli survived the severe weather in December. To help to fill the hungry gap we are now growing sprouting seeds although this will continue all year. These have gone down very well at the conference centre with everyone enjoying the extra flavours. 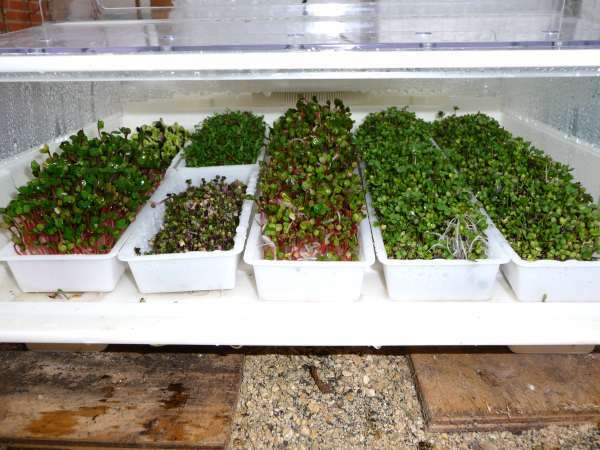 Its been so successful that we have invested in another automatic seed sprouter .As well as those below we are also growing Fenugreek and Buckwheat. Initially they were taking about 7 days from sowing before ready for use but with warmer weather this has reduced to 5-6 days depending on the type of seeds. Plenty of young plants are ready to plant out after hardening off in the frames. 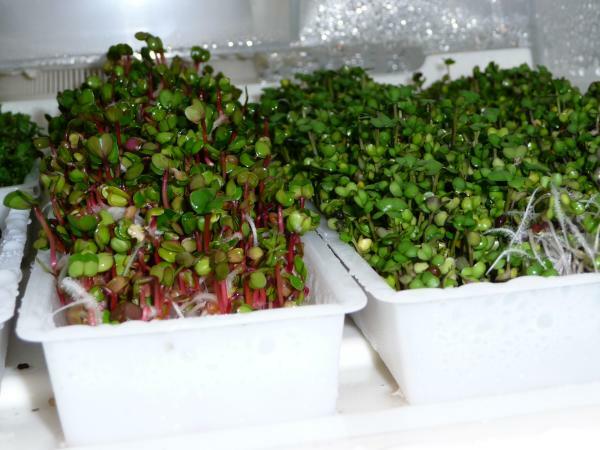 Most crops are started off in the propagator in modules including multi-seeded onions. 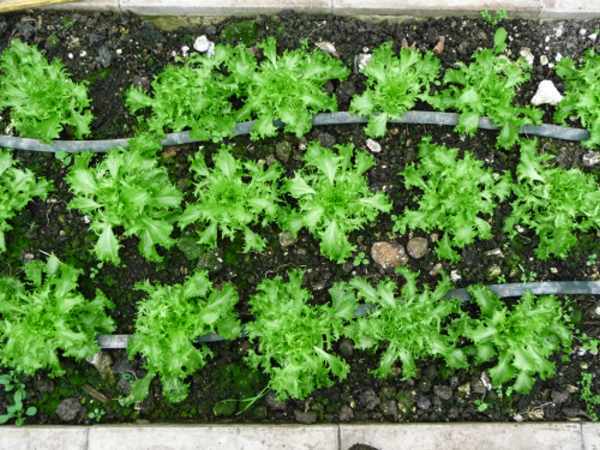 Celery and Celeriac (at the front in the picture) are sown in trays and pricked out into modules. After they are established they are moved to a cooler glasshouse as in the picture. 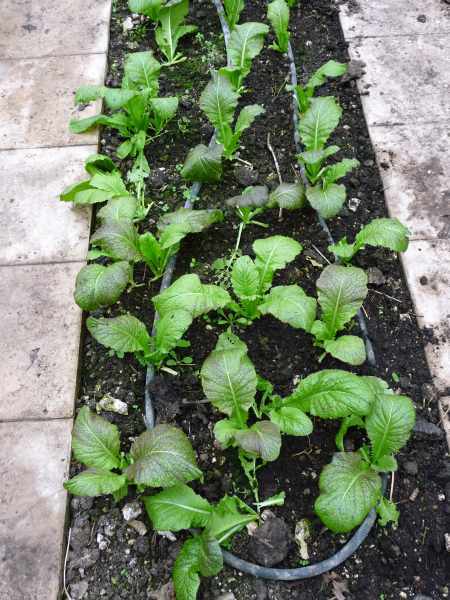 The first batch of lettuce and brassica’s are already planted out under fleece and the first outdoor sown radish also sown and covered with fleece are now up. First broad beans started in the glasshouse in pots are planted and these will continue to be sown at 2-3 week intervals. Parsnips are sown and covered with environmesh which helps to speed up germination as they are usually so slow. Plenty of herbs are on the go with a selection of basil, mixture of parsley, burnet, chervil, coriander, dill and sorrel. On the flower side sweet peas are hardening off ready for planting and nasturtiums, viola, nicotiana, poppies, cornflower and schizanthus have been sown and some already pricked out. All spring pruning is done and most of the mulching is done with just some areas of the Physic garden to complete. 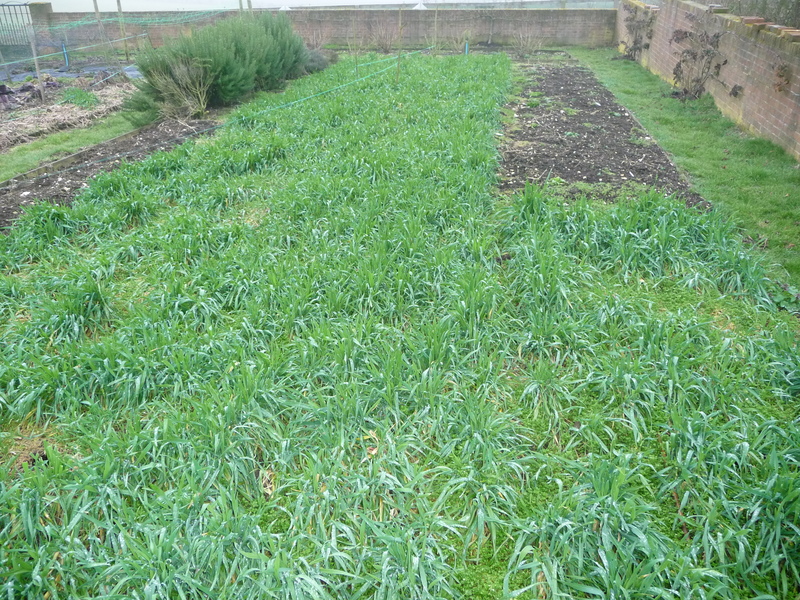 The first grass cut this year was on 7th March around the vegetable garden, potager and farmhouse. Jobs for the next month will include marking out all the beds for planting vegetables. They will all be grown on 4’ (120cm) beds. 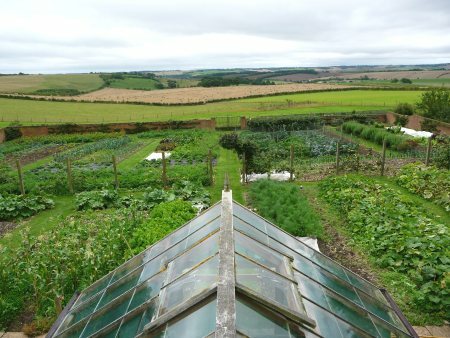 Its not quite a raised bed system but once they are marked out with the 1’(30cm) paths all planting , weeding , hoeing will be done from the paths to maintain a good soil structure for the growing crops. Perennial herbs lost over winter will be replaced. 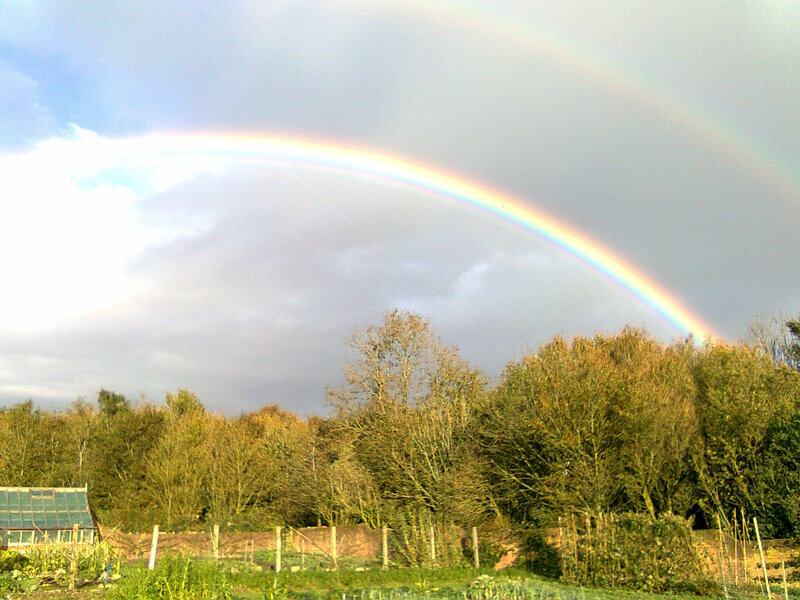 From now on I will be periodically posting a blog of what we are up to in the gardens at Sheepdrove Organic Farm. With snowdrops and winter aconites out Spring is at last on the way. All the fruit plants and trees are now pruned including cutting the autumn fruiting raspberry canes (Autumn Bliss) to the ground. All the fruit has been mulched with cow manure and compost. 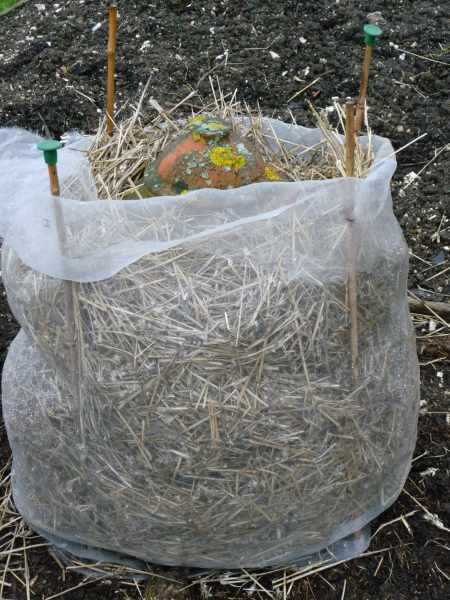 We have started forcing rhubarb keeping them in the dark with terra-cotta pots with straw added around these for extra warmth. Some seeds are sown in the glasshouse borders to get some early radish and carrots. In the propagator we have underway a selection of cabbage, cauliflower and calabrese, various lettuces, beetroot (to plant out under glass), tomatoes ( for an early crop under heated glass), peppers and Parsley (Italian Giant, Plain French and Moss Curled).Also in are the first batch of broad beans and some dwarf French beans to grow in the polytunnel. 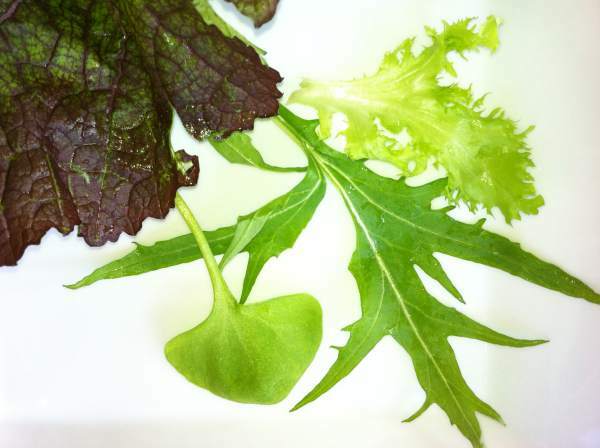 We are already harvesting Giant Red mustard, Endive ( variety Markant), Mizuna and Claytonia (Winter Purslane) which were overwintered in the glasshouse borders. Having purchased a new shredder ( http://www.elietmachines.com) we are now recycling more waste. All pruned material up to 40mm now goes through the shredder and is added to the compost bins and anything bigger is used for firewood. 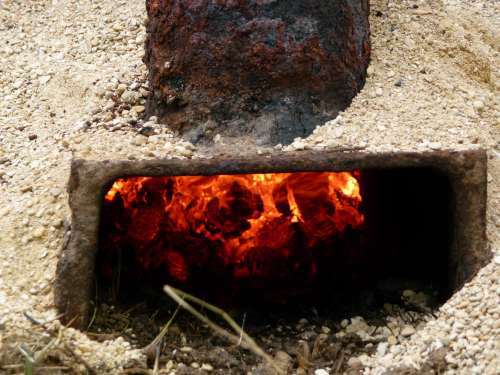 Although it heats up very quickly on its own it is mixed with manure and vegetable waste. With all the extra material we needed more compost bins and while we were preparing for this clearing trees and roots and digging holes for the posts we accidently created a man trap. A holly needed trimming to make space and the branches were piled on the ground. My colleague then walked across the holly and fell straight through it into one of the holes we had just dug. This is a quick return of karma after he hit me in the face with a wheel barrow handle while unloading it from the back of the truck last week. On going jobs are the spring pruning of shrubs , roses and herbs and cutting down the dead growth of any remaining herbaceous perennials and herbs. 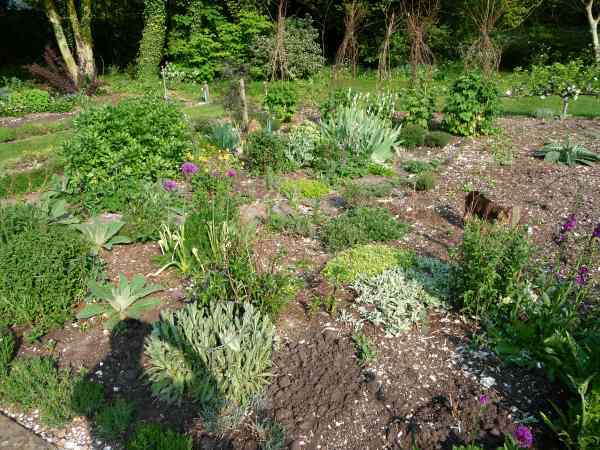 The Potager and other borders are to be mulched with leaf mould and well rotted compost. Are pesticides sprayed near you? Georgina Downs, of the UK Pesticides Campaign, said it was a disgrace that the government has decided there was no need to introduce any new measures to protect the health of rural residents from pesticide exposure. The award-winning environmental campaigner waged a 10-year pesticide safety campaign, and won against the UK government in High Court – only for the government to return to court to overturn the legal decision. Georgina pledged to continue her crusade – even though the government has rejected the introduction of mandatory measures to protect rural residents living near sprayed fields. How do I cook my turkey?